Grown by the Aztecs and discovered by botanists in 1519, Zinnia gets its name from Johann Gottfred Zinn an 18th century German botanist who worked to improve colors. 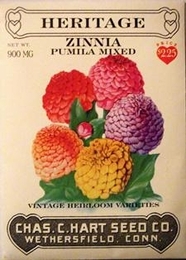 Medium size 24� plants produce an abundance of fully double pompom type blossoms about 2 ?� across in a varied selection of colors. Zinnias thrive in hot weather with moderate water. One of the easiest flowers to grow from seed. Sow seed in late spring when danger of frost is past of start indoors 6 weeks earlier in CowPots and Vermont Compost potting soil. Cover seed with 1/4 inch of fine soil well pressed down. When plants are 3 inches tall, thin or transplant 12-15 inches apart.